A comprehensive and straight forward approach for developing the embouchure and breathing techniques. Topics stressed include embouchure building, strengthening corners, increasing endurance, increasing flexibility, maximizing efficiency, breathing concepts, focusing the air-stream and developing tone. A musical approach to teaching improvisation, focusing on the styles and techniques of the masters. Topics stressed include understanding chord changes, learning solos, playing the blues and swinging. Listening to and working with the various sections of the ensemble to achieve a swinging band playing as one. Topics stressed include the roles of each player (lead, section, soloist), playing as a section, the importance of listening (to the rhythm section and those around you), proper stylistic interpretations and swinging. Developing the trumpet section as a swinging, musical unit. Devoting special attention to how a successful trumpet section becomes better and matures. Topics stressed include the roles of each player (lead, section, soloist), playing as a section, supporting the lead player, articulations, the use of mutes, proper stylistic interpretations and swinging. A performance with the big band or small group as a soloist. I have a selection of feature charts that can be provided in advance for the ensemble. If the school has specific charts they wish to play from their own library, simply provide a copy of the solo/lead part in advance. An evening of small group jazz is also available. Note: If you are interested in widening the scope of your clinic or workshop to include additional instrumentalists (rhythm section or horns), artists who've toured and recorded with the biggest names in jazz including Wynton Marsalis, Count Basie and Harry Connick are available. Clinic fees are based on the type of services provided. Every school has its own individual needs when it comes to developing the clinic curriculum, and we can work together to address your specific needs. Private instruction is available for embouchure building, breathing techniques, jazz improvisation, jazz trumpet styles and lead trumpet concepts and techniques. Each student is treated on an individual basis and the questions and needs of the player will be specifically addressed. Dan Miller was born in Waukegan, Illinois on May 31,1969 to John and Virginia Miller. He began playing the trumpet in grade school with the encouragement of his father. Growing up, he would listen to records with his father (including Miles, Dizzy, Chet, Maynard, Basie and Sinatra) which helped him form the idea of what jazz trumpet should sound like. He studied with Nick Drozdoff and Gary Slavo while growing up in Chicago, but points to two specific events which helped him to pursue jazz trumpet. First, he met Bobby Shew in Chicago in 1984. "Hearing Bobby was a revelation to me. He blew sensational bebop and such swinging lead trumpet, that I felt that here was a musician that can do it all. Bobby is also one the finest teachers in the world. His down to earth approach puts the student at ease, and allows them to quickly grasp his innovative ideas." Second, was a meeting the same year with Tom Harrell at a Jamey Aeborsold jazz clinic. Harrell was just there for one day, but "he came into the trumpet master class with Hal Galper and proceeded to tear through Cherokee, rhythm changes and the blues in all 12 keys. I sat five feet away from the front of his bell, enamored by that big, burnished sound and thought that this is what I wanted to do." He went to North Texas State University in 1987, where he began studies with teacher Don Jacoby. Jacoby, acknowledged as one of America's finest brass instructors, was able to convey his complex concepts to anyone at any level, and Miller spent many days studying with and just being around the legendary teacher. "Jake" treated his students like family, and his love of music and teaching made his students work with abandon. Miller also studied with John Haynie at North Texas. Haynie was another tremendous teacher and soloist, who helped Dan refine his playing from a technical standpoint. Miller left North Texas in 1989 to join the Woody Herman Orchestra. In January 1990 he met Harry Connick Jr. in Dallas, and Harry told him of his plans for a new big band. By June of that year the band was on the road, and it would take him all over the United States, Canada, Europe, Japan and Australia. 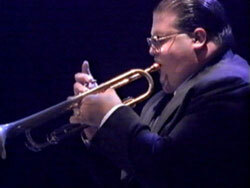 He also began working with Maynard Ferguson in 1991 (for three months during a break with Connick). Miller moved to New York City in November 1991 with his brother, trombonist David Miller. The tour with Connick lasted almost two and one half years. He returned to Maynard's band in September 1992 for a tour of the U.S., Europe, Japan and India. 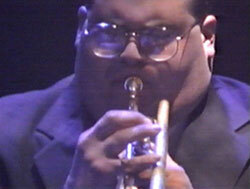 Connick re-organized the big band for a world tour from April 1993-January 1994. Miller spent August 1994 with Wynton Marsalis's Big Band at Tanglewood, MA recording and filming the Marsalis on Music project. He continued free-lancing in NYC with various artists including Wynton Marsalis and the Lincoln Center Jazz Orchestra, Frank Foster and Jon Hendricks. In December of 1995 he rejoined Harry Connick Jr. and his new funk band, which toured until May 1997. In June 1997 Miller began a fourteen month stint with Tom Jones criss-crossing the United States and returning to Europe and Australia. Connick returned to the big band format and Miller rejoined to record a new album and tour from 1998 until 2000. During his time with Harry Connick Jr., Dan Miller appeared on four of his albums: Blue Light Red Light, When My Heart Finds Christmas, Star Turtle and Come By Me. Miller also appeared on three of Harry Connick's television specials that are available on VHS and DVD: Swingin' Out Live, The New York Big Band Concert and When My Heart Finds Christmas. Dan has spent 2000 thru today free-lancing in New York City with the likes of Lionel Hampton and the Duke Ellington Orchestra. He has also been teaching and doing clinics for the Yamaha Music Corporation as a Yamaha Performing Artist and Clinician. He has also been working on a biography/oral history of Fats Navarro, with a companion volume containing transcriptions of his entire recorded output. Miller currently resides in Brooklyn, NY and digs Fats Navarro, Dizzy Gillespie, Freddie Hubbard, Kenny Dorham, Charlie Parker, Sonny Rollins and Curtis Fuller. Artists Performed with: Lincoln Center Jazz Orchestra, Lionel Hampton Orchestra, Duke Ellington Orchestra, Clark Terry, James Moody, Curtis Fuller, Lee Konitz, Branford Marsalis, Frank Foster, Jon Hendricks, Bobby Shew, Nina Simone, Diane Schurr, Carly Simon, Lyle Lovett, Carl Fontana, Pete Christlieb, Bud Shank, Frank Sinatra Jr., The Temptations and The Fifth Dimension. Television Credits with Harry Connick Jr.